At a news conference after the launch … CEO Elon Musk said SpaceX plans to launch every two to three weeks later in the year. 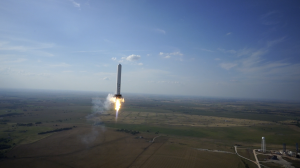 And it will continue to try to perfect the art of the first-stage landing, either on the drone ship, as it calls its autonomous boat, or at its landing zone on the cape. “We’ll be successful, ironically, when it becomes boring,” Musk said. “When it’s like, ‘Oh, yeah, another landing. No news there.’ ” What SpaceX’s landing means for commercial space travel, Washington Post, April 10, 2016. Being exciting is highly overrated. Often, the logical goal is to be boring. The trick is to do exceptional things — with boring consistency — but for people to believe that what we are doing is really, really, difficult and hence … exciting. Yes, it seems a bit disingenuous. However, until our world becomes a bit more aware and mature, many people may need help realizing that doing a great job deserves recognition and reward even if we can do it so well that we make it look easy. How are you doing at ensuring the organization knows what a great job you and your team are really doing?